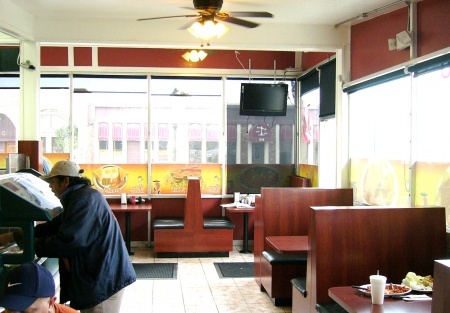 SellingRestaurants presents this busy fast-food style sit down Mexican Restaurant in La Habra on a Major Street for only $39,000. This restaurant is fully operational with a busy lunch/dinner crowd. It sits right on the street and has GREAT visibility which welcomes in many new customers. Traffic counts on this stretch of the street is 24,000, which is a huge advantage given the restaurant's great visibility from the street. It's no wonder that new customers are always stopping in to try the food. The monthly rent was just reduced for the next 5 months to $3,000.00. That's ONLY $1.50/sq.ft. This rate will transfer to a qualified buyer so hurry and take advantage of this rent reduction. Thereafter the monthly rent rate according to the lease is $4,000.00, which is still a great rate at ONLY $2.00/sq.ft. The area offers a plethora of businesses for a great lunch crowd. This spacious 2,000 sq.ft. restaurant has a very large open kitchen with a long list of equipment. A few of the large pieces of kitchen equipment include an oversized Type I hood system, flat grill, charbroiler, 2 deep fryers, 6 burner range with oven, below ground grease tank, refrigerated display cabinet, 3 door Traulsen refrigerator, walk-in freezer, and plenty more. With all of this equipment and low rent terms, this restaurant is perfect for your own food concept or continue with the same menu. The landlord will allow just about any food concept so visit the location today to see how this restaurant facility works for you. The owner is selling the restaurant because he is an absentee-owner with another career.